View More In Hemp Seeds. 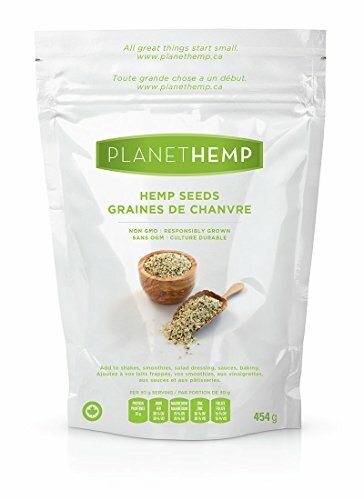 Entirely produced in Canada for highest quality, these Hemp Seeds contain plant protein and are a natural source of essential Omega 3 and 6 polyunsaturated fatty acids, fibre and B vitamins. Add them to anything: from protein shakes and smoothies to sauces, salads, dressings and baked goods. This multipurpose food with a delicious nutty flavor can be eaten with anything. These hulled hemp seeds are Vegan, Raw, S.A.F.E. Certified, Kosher Certified (Pareve) and Non GMO Certified. Natural Goodness Only. 100% natural hemp seeds only. The possibilities are endless. Use producer's ideas or create your own recipes, for delicious and nutritious foods, everyday. Full Warranty: If for any reason you are not satisfied with this product, just give us a call or email. We will give you a full refund, no questions asked. Caution: Not Gluten Free: not safe for people with celiac disease or gluten intolerance. If you have any questions about this product by Planet Hemp, contact us by completing and submitting the form below. If you are looking for a specif part number, please include it with your message.